Two undergraduate students from Iowa State University spent the summer at the University of Iowa in Iowa City, participating in internships at the Iowa Flood Center. Although their work was very different, both say it was a valuable experience and one they’d recommend to other students. Darnell Melvin, an Iowa City native, says he never thought he’d be working at Stanley Hydraulics Lab, although he had passed by the red brick building on the river’s edge many times. “I never thought about what actually goes on behind the scenes,” he says. Melvin, a senior in software engineering at Iowa State University (ISU), spent his summer at the Iowa Flood Center (IFC) working with Assistant Research Engineer Ibrahim Demir on the Iowa Flood Information System (IFIS). IFIS is a set of online flood information tools available to all Iowans. Melvin contacted IFC Director Witold Krajewski, who encouraged him to apply for an internship. The internship included installing IFIS software upgrades, managing queries and data sub-trees, and looking for faster methods of querying databases. Melvin says he enjoyed his time at the IFC. “It’s been fun. I’ve been able to meet the people here, and they’ve been very nice,” he says. Clayton Van Ekeren is a civil engineering major at Iowa State University (ISU), but this summer he worked at the Iowa Flood Center (IFC), under the supervision of Engineer Dan Ceynar. A senior at ISU, Van Ekeren first heard about IIHR from the professor teaching his fluid mechanics class, who helped him contact IIHR Director Larry Weber and IFC Director Witold Krajewski. Van Ekeren’s job at the IFC consisted of maintaining the Iowa Flood Center’s rain gauge network in Eastern Iowa. He regularly inspected the sites and leveled the gauges so they accurately gather data. Van Ekeren also had an opportunity to learn first-hand about the IFC’s stream-stage sensors, which are instruments designed to measure river stage and are built in the lab where Van Ekeren worked. The following From the Field was written by IFC student, Kara Prior, and was originally published June 5, 2013 by NASA Earth Observatory as part of the Iowa Flood Studies (IFloodS). As an undergraduate (from February 2008 to May 2009), I worked for Dan Ceynar, the engineer who coordinates the instrumentation networks for the Iowa Flood Center, and a large part of my job then and since returning to the Iowa Flood Center last October has been taking care of our rain gauges in the field. For the IFloodS campaign itself, I have also been working with rain gauges. I have been a part of the process of developing these instruments all the way through their construction, deployment, and now maintenance. April 2013. 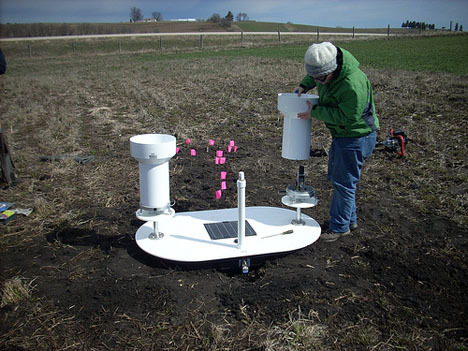 Kara Prior installs a rain gauge and soil moisture platform in the Turkey River basin in northeast Iowa. We use what are called, tipping bucket rain gauges that are a couple steps up from what many people have in their yards. 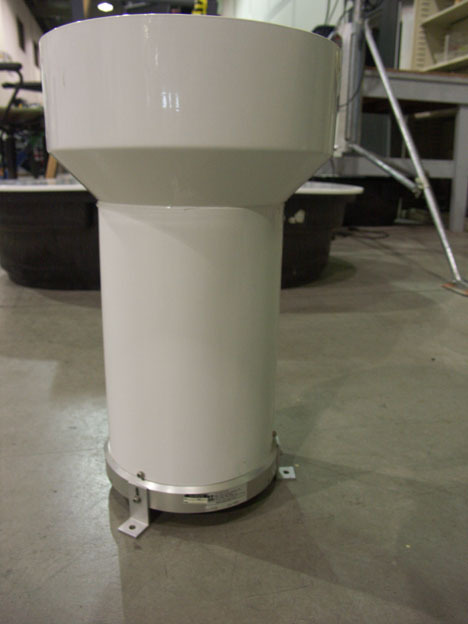 The most important part is a central swinging shaft: on the top are two small buckets, and on the bottom is a magnet. Each bucket holds exactly 1/100th of an inch of rain, and when one fills up it makes the shaft swing to the other side. As it swings, the magnet on the bottom passes over two wires and causes them to touch and complete an electrical circuit– and that’s how we record that rain has fallen. On the outside, a tipping bucket rain gauge looks like a typical plastic container. The inside of the tipping bucket is more complicated. The rain enters through the black pipe on top and fills one of two triangular buckets, here, the one on the right. When it fills to 1/100th of an inch, the bucket tips downward, raising the bucket on the left to collect rain. 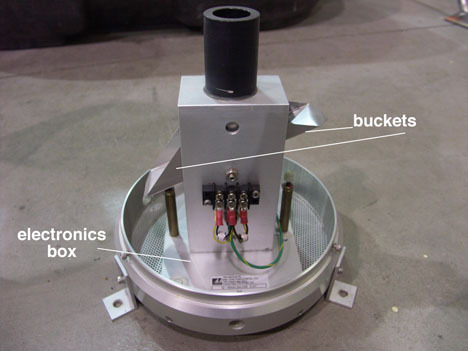 Below the buckets, is a magnet that swings and completes a circuit that records the data onto the computer. The engineers I work with designed the electronics that sit under the rain gauges and record their tips. I built the electronics boxes, which sit inside the rain gauge platform and have a cell phone modem, computer, and battery, which the rain gauges use to communicate data back to us every 15 minutes. A network of these gauges like what we have now in the Turkey River Basin can give us very detailed information about where and when rain has fallen. I also helped build the platforms they sit on — starting by picking up 50-gallon trough/tubs from a farm supply store in Cedar Rapids. All of this is our own design — Jim Niemeier’s and Dan Ceynar’s — and we just order the tipping bucket rain gauges themselves. When I started with the Iowa Flood Center last year, I also built the latest batch of stream-stage sensors. The ones I built that have been deployed thus far are in the Ames area. So, they are not directly in the IFloodS area of interest, but they are identical to the ones we have around the state. So I still feel connected to them all! April 2013. 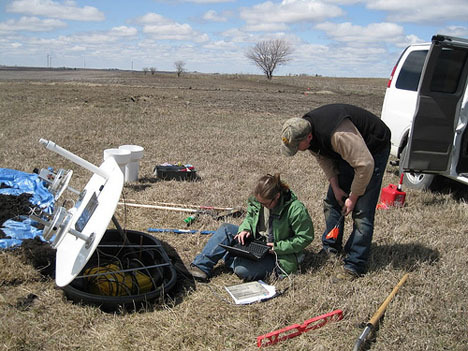 Kara Prior and Jim Niemeier set up another rain gauge and soil moisture platform for IFloodS. The rain gauge and soil moisture sensor installations involve a fair amount of digging — and with the lingering winter, we did some of our digging with a pickaxe because the ground was still frozen solid! We had quite a few cold days, which made the few warm days feel like a gift. It was surprising a couple of times how much faster things went when our fingers weren’t cold and stiff! I have loved getting to know this side of science research. Seeing all the different people and concerns that are a part of a project like this — getting to meet the landowners who let us install on their property — has been really cool. Kara Prior is a research assistant at the Iowa Flood Center, where she helps oversee a network of rain gauges. She recently finished three years of study and teaching English in China and South Korea, where she earned a graduate certificate in Chinese studies from the Johns Hopkins University-Nanjing University Center for Chinese and American Studies. Kara also holds a BA/BS in international studies and environmental science from the University of Iowa. She has a strong interest in hydroscience and water resource management.